The highly acclaimed fast-track comprehensive theory course for children and adults. Meeting the needs of students working for the ABRSM Grade 5 theory examination. A4 sized, 132 page, spiral-bound workbook with instructions and exercises. A4 sized, 198 page, spiral-bound workbook with instructions and exercises. 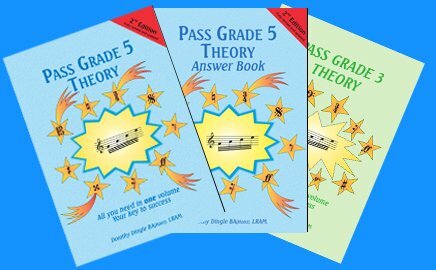 A4 sized, 44 page, staple-bound answer book companion to the Grade 5 Theory Book. This book’s fantastic! As well as helping with Grade 5 theory its explained so many things for A-level music. –N.